I’m using Win7 at home and work. I remember seeing a feature on other operating systems in my past that I wish Windows 7 possessed. Well it looks to be here (free for now – Sept 2014) and lightweight. I’ve only used it for a day but felt I should help put the word out about it. The software is called mDesktop (which stands for multiple desktops) and can be download from their website or from github. Their website has a little demo hooked up you so you can easily see how to use it. 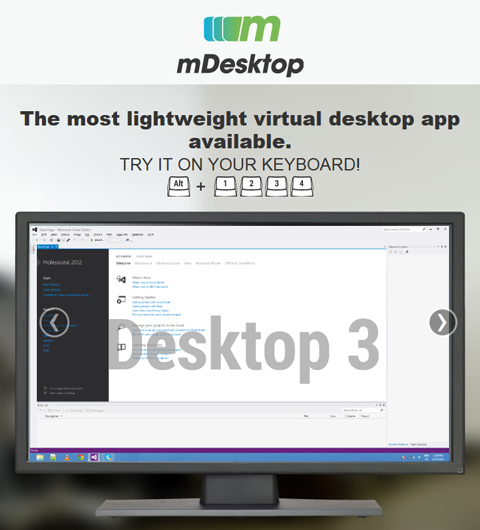 mDesktop allows you to run multiple desktops. This means that even though I run a dual-monitor setup I can have more “monitors” available to me. For example: While working I often have my email program running on my “secondary” monitor, perhaps with some code on that secondary monitor as well. On my primary monitor I’ll have open my major programs to get work accomplished, Illustrator, Dreamweaver, Photoshop and perhaps a few browser windows at the same time. With mDesktop installed I can “run another desktop screen” and have other programs open there. Maybe some music streaming service, personal web browsing windows, notes, etc. This gives me another desktop that can run “free and clear” of my main working space (primary and secondary monitors). To use, download and install the software. Once running you just hold ALT and a corresponding number key to switch to the other “virtual” desktop. ALT-1 remains on my normal desktop while pushing ALT-2, ALT-3 or ALT-4 (you can have up to 10 desktops!) takes me to my other screens. While the software is sparse for options, which is perfect (lightweight and does only want you’d want it to), you can configure your own hot-keys and as well use hot-keys to send programs to other desktops. Though only using it for a short time, this is looking to be exactly what I was after! Note: While you can download it for free by entering a “0” in the what you wish to pay box on the site it is suggested to give even a small amount to help continue development of the software.